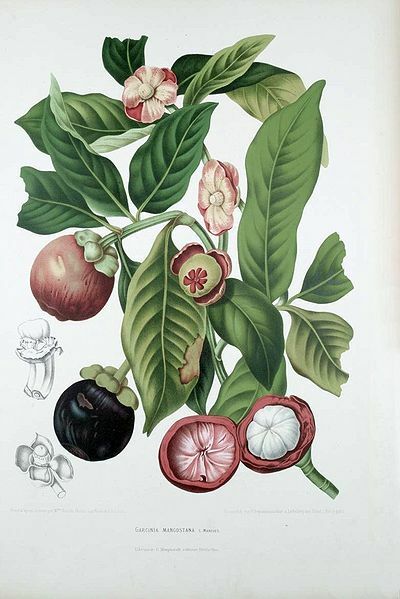 The purple mangosteen (Garcinia mangostana), colloquially known simply as mangosteen, is a tropical evergreen tree believed to have originated in the Sunda Islands and the Moluccas of Indonesia. It grows mainly in Southeast Asia, and it also grows in tropical South American countries such as Colombia and in the state of Kerala in India, where the tree has been introduced. The tree grows from 6 to 25 m (20–82 ft) tall. 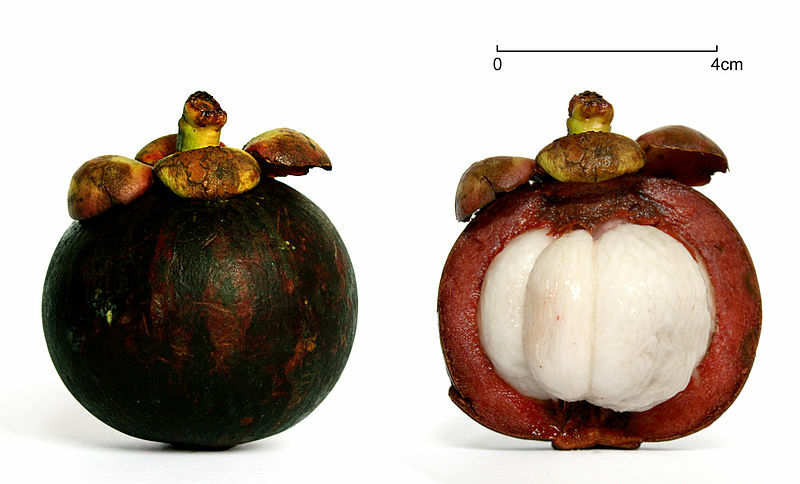 The fruit of the mangosteen is sweet and tangy, juicy, and somewhat fibrous, with an inedible, deep reddish-purple colored rind (exocarp) when ripe. In each fruit, the fragrant edible flesh that surrounds each seed is botanically endocarp, i.e., the inner layer of the ovary. 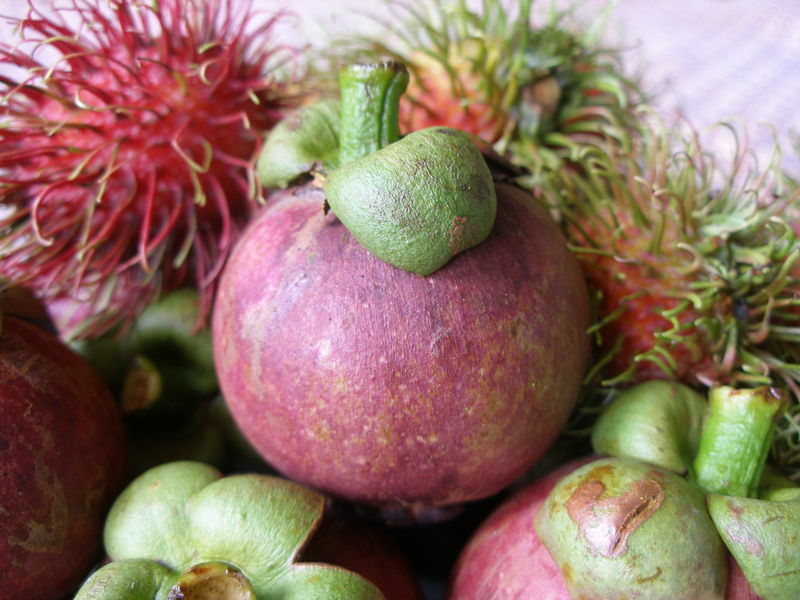 Can drinking mangosteen juice reduce arthritis inflammation and pain? Is $40 ‘super fruit’ juice really good for you? Business claims drink offers immunity boost — but hasn’t proven it. SALT LAKE CITY — On stage at a sales convention, XanGo executive vice president Joseph Morton said that when he first stumbled across mangosteen, a tropical fruit with purported curative powers, "I didn't have to have it confirmed in the New England medical journal before I would listen." The multilevel marketing company has built a huge business around its mangosteen-based juice, which it promotes as an immunity booster. The company still hasn't proved its health benefits — which it says could include a stronger immune system and improved joint function — to skeptical experts. XanGo's Web site includes a disclaimer, noting the juice is not meant to treat or prevent disease. A lab test arranged by The Associated Press found its antioxidant power to be on par with other fruit juices. 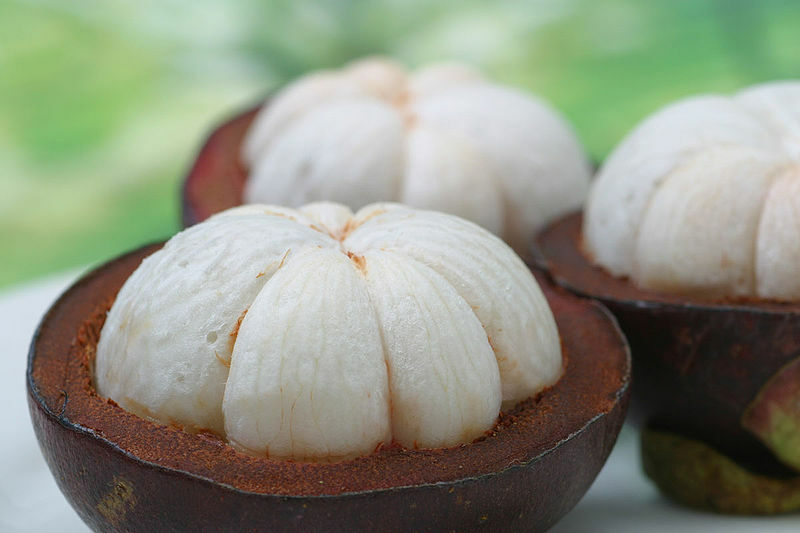 Morton, a 37-year-old triathlete nicknamed Ironman Joe, was on a business trip in Malaysia when he saw mangosteen, a white delicacy wrapped in a blood-red leathery shell, on the dessert menu. From that introduction, Morton and his business partners capitalized on a new brand category of liquid "super-fruits" that is "doing gangbusters," said Jeff Hilton, a partner at Integrated Marketing Group, a branding and packaging consultant. XanGo has more than two dozen competitors that sell fruit juices, powdered drinks and vitamin fizz tablets. Tahitian Noni International Inc. sold $2 billion worth of noni juice, from the French Polynesia fruit, in its first 10 years by 2006. MonaVie, also of Utah, bottles a blend of acai juice from the Amazon basin berry. Pure Fruit Technologies Inc. underprices XanGo on a mangosteen-based juice that sells in health food stores. 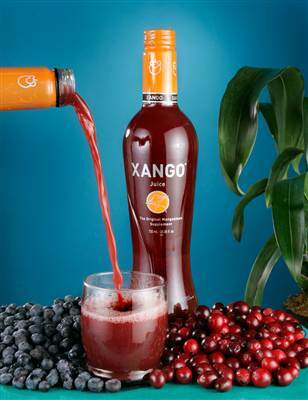 XanGo, a private company that doesn't reveal financial statements, said at the October convention that since its launch five years ago, sales of the mangosteen-based juice topped a cumulative $1 billion. It ships out bottles by the case from Spanish Fork, Utah, and says it has 700,000 unsalaried sales associates in 17 countries. "That's the only product they sell, and people are taking it around the world," said Sen. Orrin Hatch, R-Utah, who quaffs the purplish-color XanGo and pops multivitamins and other supplements every day. Hatch was the prime sponsor of the 1994 Dietary Supplement Health and Education Act, which allows the sale of supplements unless the Food and Drug Administration can prove them harmful. An independent lab test performed for The Associated Press shows XanGo's antioxidant strength is no better than other readily available fruit juices, yet it costs nearly $40 a bottle. XanGo insists mangosteen contains other beneficial chemicals. "My big concern with XanGo is that the business has gone a long way without showing any benefit in human trials," said Wayne Askew, director of the Division of Nutrition of the University of Utah's College of Health. "It's a 'Wizard of Oz' story," said Anthony Almada, president and chief executive of GENr8 Inc., a marketer of sports nutrition dietary supplements. "The industry is built on storytelling, and because they do it one-on-one, without advertising, they don't incur the wrath of the FDA." Dietary supplements are a $22 billion largely unregulated business in the U.S.
For the lab test, The Associated Press shipped a 750-milliliter bottle of XanGo to Oregon State University's Linus Pauling Institute at Corvallis. The institute measured its antioxidant strength against store-bought juices that sell for a few dollars a bottle. On a scale of molecular weight, XanGo's antioxidants measured 14,884 "micromoles" per liter — slightly higher than cranberry juice, but lower than black cherry and less than half the power of blueberry juice. Apple juice finished last in this test. "In terms of its antioxidant capacity, XanGo is in the middle of the pack," said Balz Frei, the institute's director and chairman. Antioxidants are substances added to many foods and even soap in the belief they can slow down the damage oxidation can do to cells. Frei and other scientists emphasize that antioxidants haven't been shown to actually work inside the human body. Antioxidants are known to work in test tubes, but stomach acids could neutralize them before they can get to work destroying any cell-damaging free-oxygen radicals. Uncertainties over testing protocols have stalled research, yet every day seems to bring another mangosteen bottler, as an Internet search will show. XanGo's research and development manager insists mangosteen has more to offer than its so-called oxygen radical absorption capacity — a rich cocktail of other beneficial chemicals barely known to science. "You have a fruit that's very complicated, with a lot of chemicals in it," said Mike Pugh, who dismissed antioxidant ratings as a "numbers game" He said the type of antioxidants can be more important. Pugh believes all the scientific debate can be pointless: If mangosteen makes people feel better, he said, it must do some good. "It helps with my severe allergies," said Tim Gardner of Hammond, Wis., a 27-year-old district manager for a chain of auto parts stories who drove nonstop with his wife and two other couples to Salt Lake City for the XanGo convention. Gardner said he became a sales recruit to lower his cost to $25 wholesale from $37.50 for a three-quarters of a liter bottle. "You're not trying to sell the product; you're sponsoring other people," Gardner said. "Every distributor is a customer, and every customer is a distributor." Jon Taylor, a one-time Nu Skin Enterprises Inc. distributor and trial consultant for disaffected distributors who analyzed XanGo's multitiered compensation plan at the AP's request, said it was little different from scores of other multilevel marketing ventures. It's a formula, he said, that makes money for the top 1 percent of distributors and leaves many other recruits stockpiling products they can't sell. "The reason you lose money is you have to buy products every month to stay good with the company," Taylor said. "That's the rub." Bob Freeze, XanGo's vice president for public relations, dismissed Taylor as a "disgruntled" former Nu Skin recruit "who has taken up a fight to bring down any legitimate multilevel marketing company." Provo, Utah-based Nu Skin, a $1 billion network marketing company that sells dietary supplements and skin care products, has been fined three times by the Federal Trade Commission for misrepresentations. Successful XanGo distributors take a cut of commissions from others recruited into their chain of sales associates. Denise Villahermosa, 49, who lives in northern Virginia, sits atop an organization of 6,000 distributors — "we all use the product" — that produces more than $100,000 in monthly sales. That makes Villahermosa a top-level "premier" distributor; she gets commissions, bonuses and travel rewards for her efforts. "We sell the XanGo story," Villahermosa said. "I share my story, how I got involved and how the product has worked for me. I wanted to stay healthy." XanGo executives said they haven't heard from the FDA since receiving a warning letter last summer and assume the case is closed. Paul Teitell, the FDA's assistant district director in Denver, said the matter isn't settled. The agency can seize the product, stop the company from doing business or prosecute, he said. "The fact they haven't heard from us since last summer doesn't mean the case is closed," Teitell responded. "We warned them, and what happens beyond that warning is based on the way they behave, not how we behave." On a scale of molecular weight, XanGo's antioxidants measured slightly higher than cranberry juice and less than half the power of blueberry juice, according to a lab test by The Associated Press.